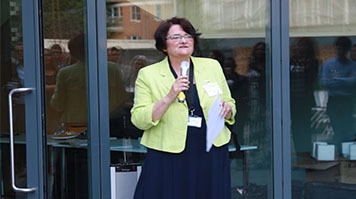 Professor Sara Chandler, a solicitor specialising in landlord and tenant law, was recommended for the appointment based on her work on pro-bono and human rights cases. She has been instrumental in developing the concept of a clinical legal education, a model which allows students to give pro-bono advice to the public, under the guidance of qualified lawyers. And has made a major contribution in the field of human rights - winning the LUKAS Human Rights Worker of the Year Award in May 2014. Professor Chandler has helped to set up our Lambeth County Court Help Desk and the South London Law Society Future Lawyers Scheme - which offers our students placements with local solicitor’s firms. And she is currently First Vice-President, and will be President, of the Federation of European Bar Associations (FBE) in 2017. The long list of guests* who turned out to celebrate with Prof. Chandler included judges, local lawyers, students and colleagues, all of whom she has worked with throughout a long career fighting for human rights and access to justice – read her speech to the guests (PDF File 51 KB). Certificates were also handed out to student volunteers working in the LSBU Legal Advice Clinic and our Lambeth County Court Help Desk – these were presented by the Honourable Mr Justice Cranston of the High Court and District Judge Suzanne Burn of Lambeth County Court respectively. Prof. Chandler said: “I am delighted that my work in pro-bono, human rights, law centres and university law clinics has been recognised by this award. I am proud to be a member of LSBU’s alumni and a member of staff in LSBU’s Law Division which has a strong commitment to human rights and access to justice. Find out more about LSBU's Legal Advice Clinic and the School of Law and Social Sciences.